Because everyone should have choices! You may wonder why you are getting two different versions of this edible cocktail. There's two versions because I had tons of lovely custard cocktail gel left over from the samples for the photo shoot. 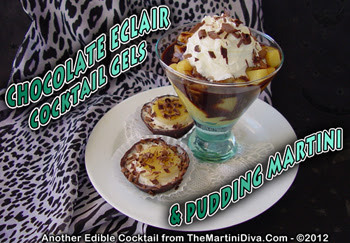 Why not make a pudding martini too? So I did. I hand made these chocolate cups because my mold did not come in time. You can actually buy ready made chocolate cups at Amazon. I'm doing that next time, it's just plain easier - though I did infuse my chocolate cups with a nice little pinch of sea salt. You can make your own alcohol infused whipped cream but it does take some special equipment. I just buy mine in several flavors - also at Amazon. If you want a firmer custard cocktail gel to serve without the chocolate cups just add one additional package of gelatin to the custard recipe. The martini is pretty powerful but if you would like to cut the alcohol level down simple replace half of the Cake Vodka with milk. Mix this milk in with the vodka and the caramel sauce and add it to the recipe where you would normally add the cake vodka and caramel. Remove from heat and set the gelatin milk mixture aside. Once your pudding gel has set up you are ready to cut or scoop. Melt your chocolate chips in a double boiler until smooth and creamy. Avoid getting any liquid into your chocolate as this will cause the chocolate to seize up. Add a pinch of salt and gently stir in. Pour this into chocolate cup molds and put in the fridge to set up. Spray a little alcohol infused caramel whipped cream into the cup leaving enough room to set in the custard gel. Gently place your custard cocktail gel into the whipped cream. Shave on some dark chocolate and plate. Scoop some little spoonfuls of the cocktail gel custard into a small martini glass leaving some open spaces. Pour the chocolate syrup around the pieces and let it drip down into the spaces. Top off with the alcohol infused caramel whipped cream. Shave on some dark chocolate and serve. Made your National Chocolate Eclair Day, didn't I?